I haven’t tried everywhere in Fremantle yet, but from my limited experience, I can’t exactly say that it’s a foodie destination. There are lots of cafes and eateries, but finding a good one seems to be a bit of a chore, and after going to a local’s favourite restaurant, I found myself feeling bloated by some of the worst Italian food I’ve had in a while. So I get excited when I find places like Blink Coffee, which bills itself as the smallest coffee bar in Freo and has the slogan “If you’re not pissed with the world, you’re not paying attention.” Yes, this is fine coffee served with attitude, but attitude in a nice, relaxed, friendly way. They also use a quality local bean supplier, Fiori, keeping up the boutique feel. Perth is a restaurant wasteland, the proprietor readily told me, recommending Perth’s Star Anise and little else. He seemed to not want to get my hopes up about the food here, and neither did most other people I spoke to about the restaurant scene. 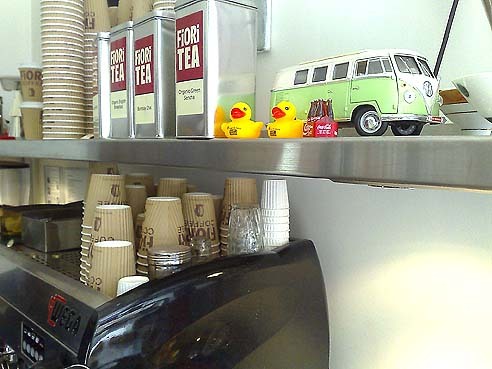 Maybe so, we’ll see, but for now it was great to have a fine cuppa poured here, amid a coffee bar that prominently features rubber duckies and a miniature VW van. I did fine one enjoyable meal in Fremantle, and that was a walk-by dinner at Maya, a lovely Indian restaurant that’s also memorable for the designer dresses that hang on its walls. Apparently it’s from the former co-tentant, who’s now opening up her own store across the road. In any case, the room was packed with locals and a large table of Indians tucking into one of the banquet feasts. 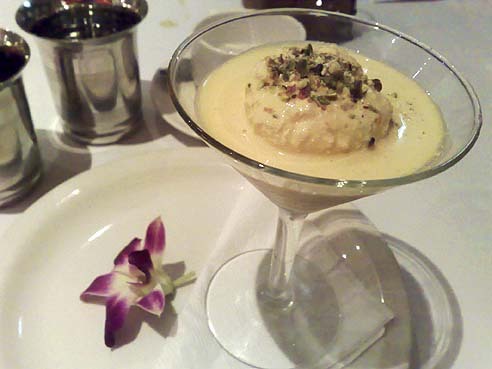 The feasts sounded terrific, but you need a minimum of four people, so Sarah and I settled for a chicken Mumbai and a dahl, and then polished it off with dessert. Sometimes finding a decent meal when you travel means keeping it simple. Life has been hectic of late. Sarah had her big CD launch at Will & Toby’s, I made the move from Elizabeth Bay to Bondi, and now Lonely Planet has come a’calling, so I’m keeping the boxes packed and preparing to ship them down to Melbourne. So lucky for us that we already had some respite planned out in WA, with the excuse of a friend’s wedding in Perth being the impetus to check out the gastrotentials (yes, that’s a real word… as of today) of the West, from Fremantle to the Margaret River, the Great Souther wineries and back. But first we needed to learn the local abbreviations, as you do in Australia. So we started in Freo (Fremantle), then hid out in Rotto (Rottnest Island), did a bit of shopping in Subi (Subiaco) and then hit downtown Perth, which inexplicably isn’t called Pertho, Pero, P-Town, Peo or just Po. Pero means ‘dog’ in Espanol, so I’ve taken the liberty to be the first to abbreviate the city name and that’s my pick. I’ll test it out on the locals, while wearing my Sydney Swans scarf of course, and get back to you. We were on a bit of a mission to get to Rotto, so after touching down on the tarmac, we immediately hopped into a cab and skirted Pero in favour of the 30-minute ride to seaside Freo. Fremantle is a bit of a quirky place, and it grew on us over time. It’s got the working class feel from the docks, a bit of a hippy vibe at the Fremantle Markets (a great spot to pick up fresh produce), and a surprising number of great fashion boutiques. 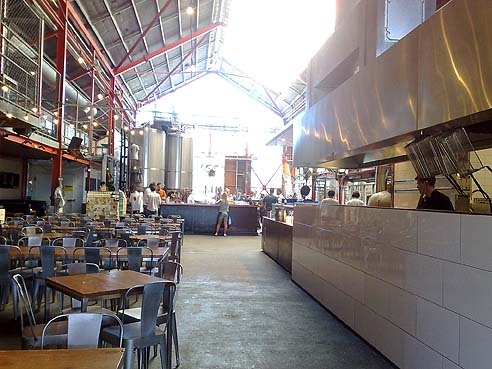 It’s also home to the Little Creatures Brewery, a place that was the obvious favourite from locals and visitors when I was running the yourRestaurants restaurant guide – that and the Must Winebar by and far received the greatest numbers of user reviews and accolades. So we started by asking the bloke at the front desk of our hotel, “Where do you find the…”. 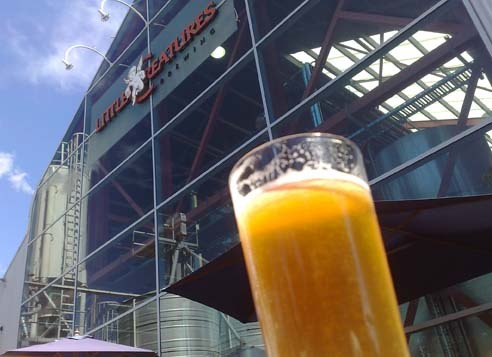 “Little Creatures Brewery, right?” he interjected on autopilot, and gave us directions. As instructed, we headed towards the ferry wharfs, made a left by the B Shed, traipsed around some industrial buildings, past the reputable Mussel Bar, and then came upon the sprawling and shmicked up warehouse shed, with steam rising from its roof exhausts that serves as the Brewery’s home. I don’t know if it’s true or not, but someone was telling me that the place used to be a massive alligator farm. Which would make the name Little Creatures a bit more interesting to ponder over an ale or twelve. 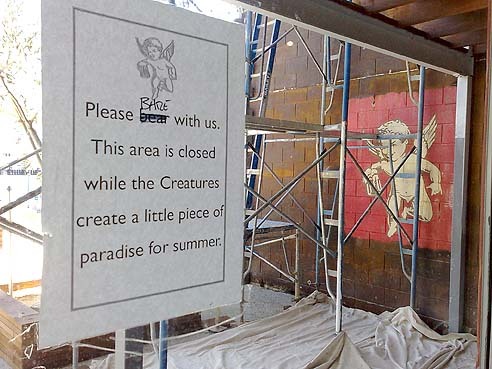 Either way, there were plenty of creatures in what was supposedly the outdoor holding pen area, soaking up the sun, enjoying a schooner of brew and taking in the restaurant’s tapas and woodfired pizzas. The crowd seemed to be a mix of travellers and working-class locals, although if you’re getting sozzled at 3pm on a Tuesday, I’m not sure how much working is actually being accomplished. We staked out an open bench within the bustling courtyard, then had a Captain Cook inside. There we found soaring ceilings multiple metres high, and heaps more seating, mostly unoccupied, as most customers had opted for sun over shade. But there is heaps of seating indoors, and even more on a mezzanine level that frames the warehouse floor like a prison cell block (the metal fencing is what does it, I think). But in a groovy way. I also had a looksee out back, where construction workers were busy creating a second outdoor space facing the waterfront. As you’d expect, you can have a peak at the brewing equipment, which is all shiny and stylishly industrial. There’s also a bar where blokes pour several types of grog, from the main Little Creatures Pale Ale to their Light Ale, Pilsener, Roger’s Ale and an instantly forgettable cider (Australian brewers should figure out how to make decent normal – as in non-fizzy, non-alcoholic – cider first and then work on fermenting it). The Pale Ale is one of the best widely distributred bottles you’ll find anywhere in Australia, and even from the source, it’s still by far the best of the bunch. Here it just seemed a bit fuller, a bit fresher, a bit more bitter on the back palate to keep things interesting. Ironically, I found myself more intrigued by the wine list, which had numerous good drops by the glass. 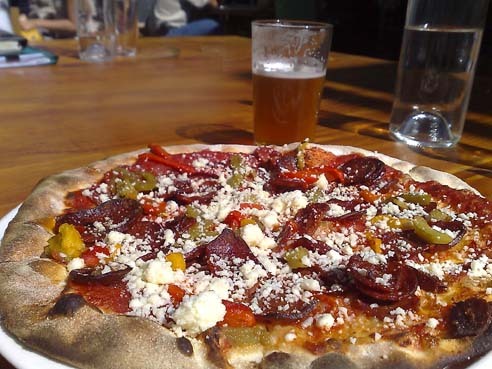 The lunch menu consisted of tapas, different takes on mussels and an array of woodfired pizzas. We took recommendations from the waitress and opted for the kangaroo skewers and shared a pizza with goat’s cheese and sopressa. The grilled roo was juicy but chewy, the pizza doable but kept mindless by a flavourless base. Budding pizzaolos need to understand that wood alone doesn’t make a good pizza. Still the overall experience was positive and well enough for accompanying a beverage. If you find yourself in Freo, I recommend a visit, but I’d keep the emphasis on the sun and what’s in your glass. I had the most interesting lunch today. Across from Circular Quay. In front of Customs House. Dining… amongst the vines? Who’d a thunk. 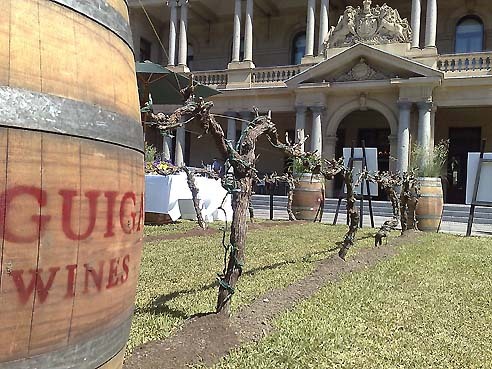 Yes, one of the most unique wine promotions has come to Sydney, in which McGuigan Wines has set down a massive patch of grassy lawn, which they quickly did on Tuesday, and then ‘planted’ six rows of shiraz vines. The significance of this part of Circular Quay is that this is approximately where the First Fleet first unloaded their cargo, and where the first cuttings came from the Old World, and therefore where the Australian wine industry was born. And, well, it looks pretty damn cool in an area that’s mostly just a concrete pedestrian crossing. Of course, the underlying excuse is that McGuigan is trying to raise its profile, and its pricing, so thus the high-profile spread to promote the company’s new Discover wine range, which is featuring four varietals: a Victorian pinot gris, Adelaide Hills sauvignon blanc, Limestone Coast rosé (from cabernet grapes) and Langhorne Creek shiraz/viognier. They’re all priced at about the $16 mark, and are aimed at bringing wines with more elegance and finesse to the label as it tries to make people think of it as more than a moniker for cheapie $8 wines. The geographic diversity also aims to reinforce the fact that McGuigan is a lot more than just its Pokolbin headquarters. “People think of us as the Hunter, but it’s really a small part of our range,” CEO Dean Hudson tells me and other wine journos. So at a table under umbrellas, I sit down with a number of wine writers, including the Sydney Morning Herald’s Huon Hooke and prolific wine scriber Windsor Dobbin, as well as handful of top brass from McGuigan Simeon, including Neil McGuigan, Hudson and their chief winemakers from the Barossa and Hunter. Out of the four Discover wines, my favourites are the rosé, which is light and dry yet with just enough residual sugar to keep it interesting, and the sauvignon blanc, whose passionfruit is lower-key than those Marlborough fruit-bombs. For me, that’s a good thing. McGuigan has more brands that just its eponymous one, which includes its acquisition of Nepenthe, best known for its sauvignon blanc in the Adelaide Hills, and the artisan Yaldara label, know for its impressive chateau in the Barossa. To little wonder, I am most excited about the Yaldara shiraz, which goes for some $70 a bottle and is only produced during top vintages. It is complex and has plenty of structure to work wonders in my cellar. If I had one. Might be time to buy a wine fridge. If all goes well, McGuigan plans to add a higher-level range under its own brand, which I think would do well to better endear enthusiast wine folks to its bottlings. That aside, I’m admittedly more excited about this vineyard in the city. The square in front of Customs House would be a helluva lot more pleasant if we could rip up the pavement, properly plant those vines, and have a wine bar and restaurant along the grassy knoll. Now that Clover Moore has done so well with liquor licensing, maybe we can add that to her to-do list. In the meantime, there’s free grog to be had, so escape the office tomorrow during lunchtime and have a tipple as you skip through the vines. Otherwise, you’ll have to drive up to the Hunter to get similar treatment. Do Chefs Hate Food Blogs? Here’s an interesting story from ABC News about the impact food blogs are having on top restaurants and restaurateurs in the US. 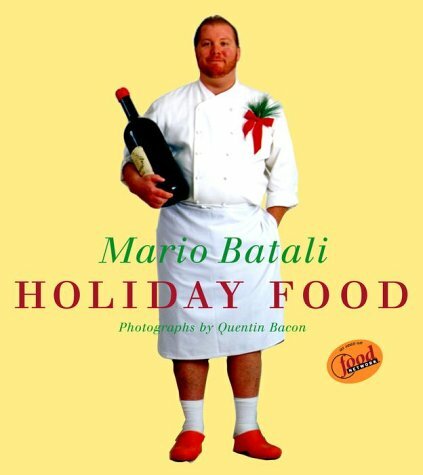 American celeb chef Mario Batali talks about how he despises them, while restaurateur Mauro Maccioni from Manhattan’s famed, and infamous, Le Cirque goes as far as flying a disgruntled blogger back to the restaurant for some improved front-of-house treatment. Any Australian chefs have their own opinions on the subject? I’ve never been to Astral before, and a big part of that has been the location. It’s atop Star City, which, along with Darling Harbour, has to be my least desired Sydney destination. I’m not keen about facing humourless blackjack dealers in a cavernous room, and I’ve made it a point not to contribute to NSW’s gambling addiction. Even so, I’ve always wanted to go to Astral in spite of Star City, but I just needed a bit of extra impetus to get me there. I’ve been very curious about Sean Connolly’s food for some time now, especially since he’s managed to create such a positive gastronomic buzz in a building that was dying for a touch of class. And that interest went up a notch further this spring when Connolly became the surprise hit of the Sydney Morning Herald’s Good Food Guide awards, picking up the coveted gong as Chef of the Year. By all accounts, Connolly was as surprised as anyone, and provided an amicably humble acceptance speech. So when I received an invitation to check out the relaunch of Friday lunch at Astral – after a hiatus of several years – I jumped at the chance to sample the ‘wunderkind’ chef’s offerings, even if he isn’t the babyface he was when he first took the helm. I get to Star City on a perfectly sunny midday, and walk up the steps from the CBD-facing side, where I meander for a bit until a helpful staffer points out that the elevator I need is across the other side of the casino floor. So I take the dime tour, scoot around the pokies, shimmy past the ceiling-high fishbowls and then find my vertical chariot that ascends to the 17th floor. As soon as the elevator door opens on the penthouse level, I’m greeted by light and space and the feeling I can breath easily again. I’m not sure what it’s like here at dinner, but as I walk into the restaurant, the vibe is professional but completely relaxed, and the interior warmly bright. The staff promptly receive me and then lead me to the private dining room to join an intimate gathering of other food and travel journos. At the end of the room, the glass doors are open, revealing a northeast-facing panorama that spectates over the Harbour Bridge, Millers Point, Luna Park and more. It’s a classic harbour view, and made that much more impressive and unobstructed by its high perch. I take a seat at the large walnut-stained table and take notice of the 17 copper-chrome lamps that decorate the ceiling. 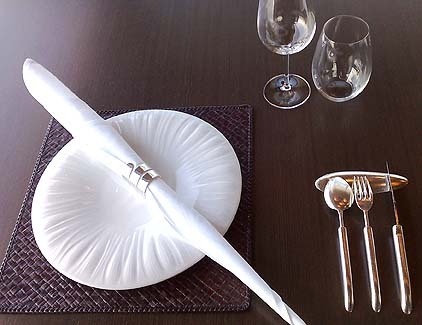 It’s equally impressive to look down, with a table setting invested with luxe El Bulli plates from Spain, Michel Bras (as in the three-Michelin-star chef) silverware from France, and fine glassware to match. The exy setup has inspired a bit of theft as well, so as soon as I hear about the new metal detectors, any kleptomaniac dreams are instantly dashed. For such a fine dining environment, the lunch prices stay within respectably mortal, albeit not exactly frugal, limits: $49 for two courses, $65 for three. Today, there’s a choice of eight entrees, from confit chicken and leek terrine with toasted brioche to marinated tuna with smoked eel dust and a yuzu emulsion, and seven mains, tempting with wagyu skirt with béarnaise sauce or maybe slow-roasted cannon of lamb with goat’s curd creme and cumin-spiced ratatouille. Of course, if you’ve done well at the roulette tables downstairs, there’s caviar for two with blinis for $290 for 30g, or $425 for 50g. 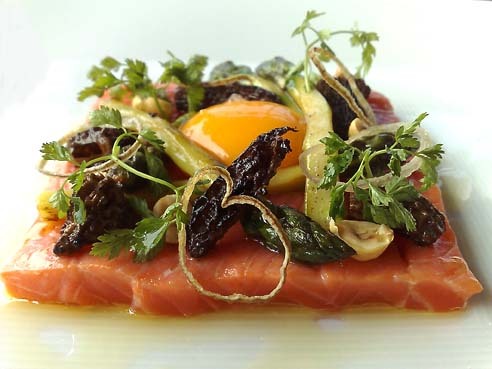 I start out with a warm pavé of ocean trout, a very tender square of fish that’s topped with a fried egg, the uncommon sight of fresh morels, asparagus, thin rings of fried eschalot and dotted with chopped hazelnut. It’s lightly flavoured with a vinaigrette and I am so overjoyed with the dish, especially as the soft yolk oozes lovingly over the fish, I sit smugly, knowing that I’m immunised against menu envy today. 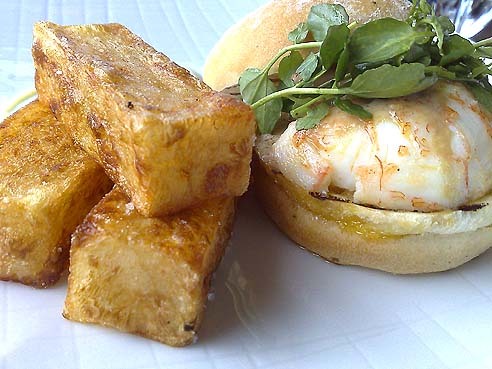 For my main, I go for the $10 supplement – which, of course, you do with abandon when someone else is paying – and order the intriguingly decadent lobster burger with foie gras butter and handcut potatoes. It comes out with a solid tail of lobster meat, painted with a shmear of the truffle butter. The only downside is that the meat has some grain that won’t surrender and wants to all come out at once, so I have to put the buns down and turn to my trusty knife. 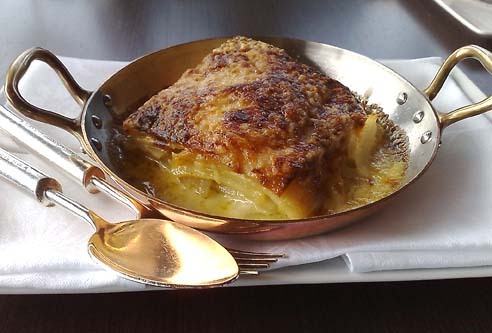 It’s still very good, yet it is overshadowed by a supporting actor: a golden side dish of gratin dauphinoise. Its brilliance is best described by its kitchen journey: Connolly boils the potatoes in cream for nearly 30 minutes, then removes the spuds, reduces the cream, seasons it with garlic and rosemary, pours it back in with the potato slices and then melts heaps of parmesan over the top. It is richer than a Murdoch, and about the most pleasurable way to grow love handles. “You’re not coming to Astral to keep fit,” admits Connolly, who’s joined us at the table for a chat. The chef saves one of his best tricks for last: what the restaurant contends is one of only three cheese trolleys in all of Sydney (Bathers’ Pavilion and Bilson’s offer the other two). And this one is a doozy. I look over 14 artisan and imported cheeses, from an unctuous triple-cream Brillat-Savarin to a Corsican Fleur de Marquis coated in rosemary, a non-pasteurised Roquefort, and a circus of other lactose wonders. 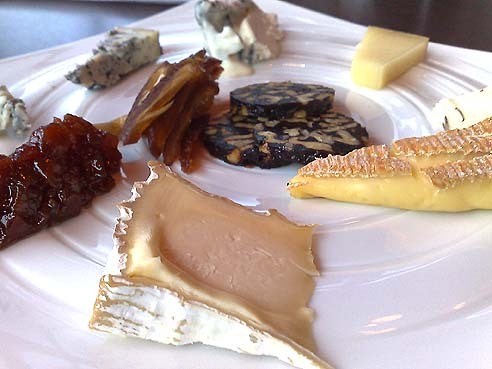 If I closed my eyes, I could be in France… or the Simon Johnson cheese room. I leave Astral a little heavier than when I entered, but with little regret. And though I still have no desire to join Chinese tourists and footy players at the poker table, I think I might find myself lured to the apex at Star City, where the dining experience is elevated in more ways than one.